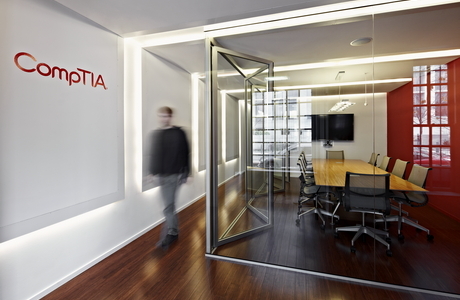 Occupying a Capital Hill rowhouse, the Computing Technology Industry Association, or CompTIA, planned a move into a new facility unsuited to the trade group's mission – educating and advocating for IT professionals and companies. KUBE Architecture's renovation was geared toward transforming the dark and uninviting space into a bright, sustainable and state-of-the-art workplace befitting the tech-savvy organization. With "order and light" as the watchwords of the renovation project, KUBE set about finding ways to create a feeling of openness, much of which was accomplished by defining individual offices as “additive volumes” – essentially interior glass boxes made with light metal partitions. 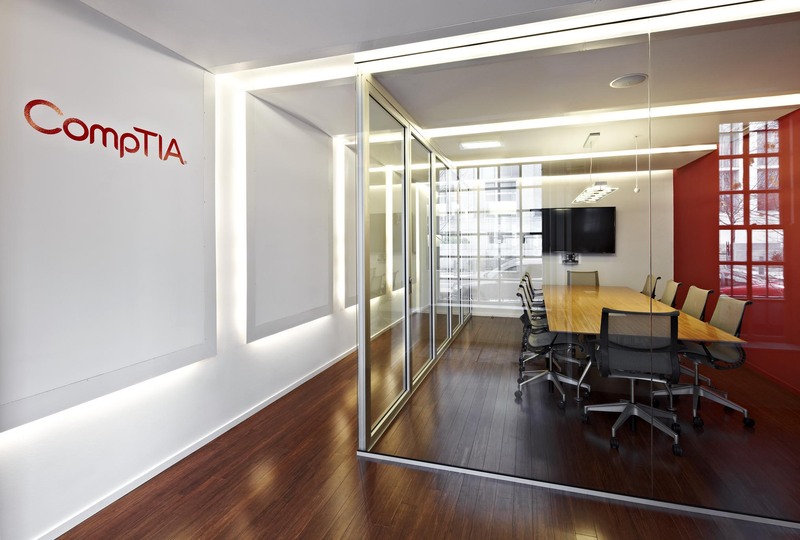 For CompTIA's conference room, on the other hand, the group needed a flexible solution that offered both openness and privacy: "The owners desired privacy for conferences, and openness for gatherings," recalls Janet Bloomberg, AIA, a partner with KUBE Architecture. "We achieved both with the use of a folding glass wall from NanaWall." "We selected NanaWall for the CompTIA office renovation for two reasons: openness and flexibility." For a large opening separating the conference space from the rest of the office, KUBE specified five panels of NanaWall's SL45 Aluminum Framed Folding System. The top-hung folding door system allows the space to serve as a completely enclosed and private conference space benefitting from NanaWall's robust sound attenuation properties, says Bloomberg. But with a quick change, the SL45 suddenly opens for a gathering space and function room that is completely integrated with the rest of the facility. This feat of flexibility could not be achieved with conventional sliding glass doors and partitions, according to the KUBE and CompTIA project team. KUBE's design also employs the folding glass wall as part of the design's natural daylighting strategy, and a sleek addition to the new modern look of the renovated complex. "We selected NanaWall for the CompTIA office renovation for two reasons: openness and flexibility," says Bloomberg. Like the conference room opening, many features of the renovation add to the feeling of open space. The “glass box” offices, for instance, likewise use full floor-to-ceiling glass walls along the main corridor. KUBE's renovation for CompTIA also delivered a 21st-century appeal, with cove lighting wrapping from floor to ceiling and a sculptural staircase linking the front and rear portions of the building. The effect is to transform the dark, close quarters in the outdated structure into a light and airy office complex suitable for the Information Age. KUBE's design focused on this aspect of the transformation, a major part of which was the new conference room. Previously located in the basement, the conference room was moved to the main floor adjacent to the entry area. In this way, KUBE’s redesign presents the meeting area to visitors as a gesture of transparency and collaboration. It is also a stunning glass-enclosed volume – or, when desired, a fully open function and event area. 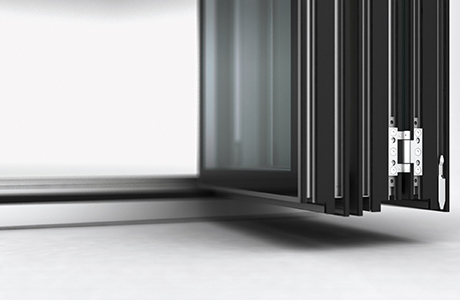 Open or closed, the effect of the five big transparent volumes is a bright, inviting, modern and friendly interior. "As a result, the conference room is a centerpiece of the design," says Bloomberg. "Furthermore," she adds, "the aluminum-and-glass panels give the space a modern atmosphere that was critical to this project." The sleek, modern conference room that first represents the sustainable interior to those who visit the forward-thinking and tech-savvy trade group's revitalized offices. And NanaWall's SL45 system provides the necessary flexibility, transparency, sound attenuation and modern look that make the space effective as well as eye-catching. "The team at NanaWall helped us develop an opaque sound deadening glazing system that afforded the privacy we needed, yet the flexibility to combine smaller spaces to accomodate larger groups. Oppenness and performance all in one."